Posted on December 6th, 2011 in Events. No Comments. PechaKucha is a style of presentation consisting of 20 slides timed at 20 seconds each, for a total of 6 minutes and 40 seconds. 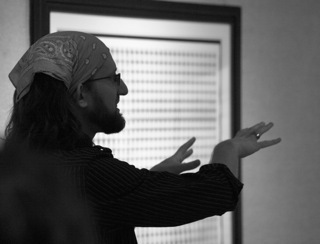 I gave a PechaKucha talk in Orlando, Florida at Blank Space Gallery on December 2nd, 2011. The title of my talk was “Chaos and Computation”, and I shared a bit about my artwork, artistic process, and the context behind my work. I apologize for the bad quality of the video, but it’s better than nothing!